Officials are investigating a sudden spike in drug overdoses in the Philadelphia area over the weekend. Health officials are investigating a sudden spike in non-fatal drug overdoses in the Philadelphia area over the weekend. Officials say more than 100 people were hospitalized between Friday and Saturday. Philadelphia Health Commissioner Tom Farley said the cluster was the largest he has seen in two years as head of the city's health department. Farley says it's unclear whether the substance responsible was heroin, fentanyl or something else. Health officials are still waiting for results of tests of bags found in the hands of arriving patients. 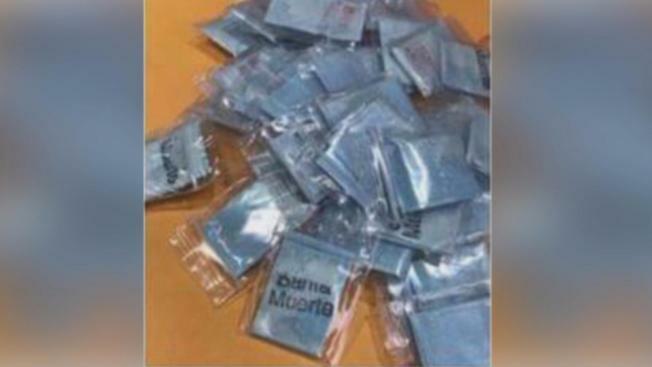 Montgomery County officials say the drug may be “Santa Muerte," meaning “The Holy Death,” a batch of heroin adulterated with an anticholinergic agent. Sold on the street with the name “Perfect 10,” symptoms of the batch include agitation, combativeness, delirium, dilated pupils, seizures and hot, flushed and red skin. Officials warned first responders that patients overdosed on Santa Muerte are typically extremely combative and agitated when being treated with the anti-opiate drug Narcan. At least two female Philadelphia EMS workers who responded to reported overdoses Friday were hurt after being attacked by patients, according to officials. “This is an important lesson for everyone on how dangerous it is to buy drugs on the street and use them,” Dr. Farley said. Despite the rise in overdoses, officials say the batch didn't cause a spike in drug-related deaths over the weekend. Farely said seven people died of apparent overdoses between Friday night and Sunday morning, which is about the typical overdose death rate. Police and the health department are currently warning people about the issue as they continue to work to confirm what the drug actually is. They expect to complete their testing this week.